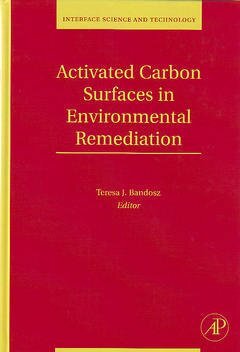 Activated Carbon Surfaces in Environmental Remediation Bandosz Teresa J.
Auteur : Bandosz Teresa J. Activated Carbon Surfaces in Environmental Remediation provides a comprehensive summary of the environmental applications of activated carbons. In order to understand the removal of contaminants and pollutants on activated carbons, the theoretical bases of adsorption phenomena are discussed. The effects of pore structure and surface chemistry are also addressed from both science and engineering perspectives. Each chapter provides examples of real applications with an emphasis on the role of the carbon surface in adsorption or reactive adsorption. The practical aspects addressed in this book cover the broad spectrum of applications from air and water cleaning and energy storage to warfare gas removal and biomedical applications. This book can serve as a handbook or reference book for graduate students, researchers and practitioners with an interest in filtration, water treatment, adsorbents and air cleaning, in addition to environmental policies and regulations. Chapter 1. Types of carbon adsorbents and their production. Chapter 2. Pore formation and control in carbon materials. Chapter 3. Characterization of nanoporous carbons by using gas adsorption Isotherms. Chapter 4. Surface chemistry of activated carbons and its characterization. Chapter 5. Desulfurization on activated carbons. Chapter 6. Applications of nanotextured carbons for supercapacitors and hydrogen. Chapter 7. Activated carbon adsorption in drinking water treatment. Chapter 8. Adsorption of organic compounds onto activated carbon – applications in water and air treatments. Chapter 9. Activated carbon filters and their industrial applications. Chapter 10. Adsorption of chemical warfare agents. Chapter 11. Activated carbons as medical adsorbents.